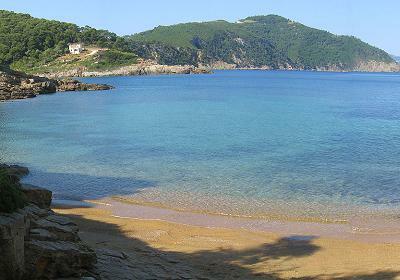 The beach of Tourkoneri on the island of Alonissos in Greece, information and pictures. The beach of Tourkoneri on the West side of the island north of the chapel at Aghios Andreas is used as a naturist beach. The area is excellent for walks, because here you can see nature at its best. You find Tourkoneri Beach at the end of a long dirt track and it is a pebble beach. The beach is surrounded by rocks and behind it is the pine tree forest. This is one of those beaches where the first ones to arrive make it the kind of beach that it will be. In the wider area or Tourkneri you can find several other unspoiled small pebble beaches such as for instance Agioi Anargyroi Beach and Megali Ammos. On all these beaches are no facilities, so hikers should bring a supply of water. In this area in the southwest of Alonissos the hills that you have to climb are not very steep and the paths are quite wide: the perfect piece of Alonissos for lovers of nature and tranquility that want to find a beach to themselves.